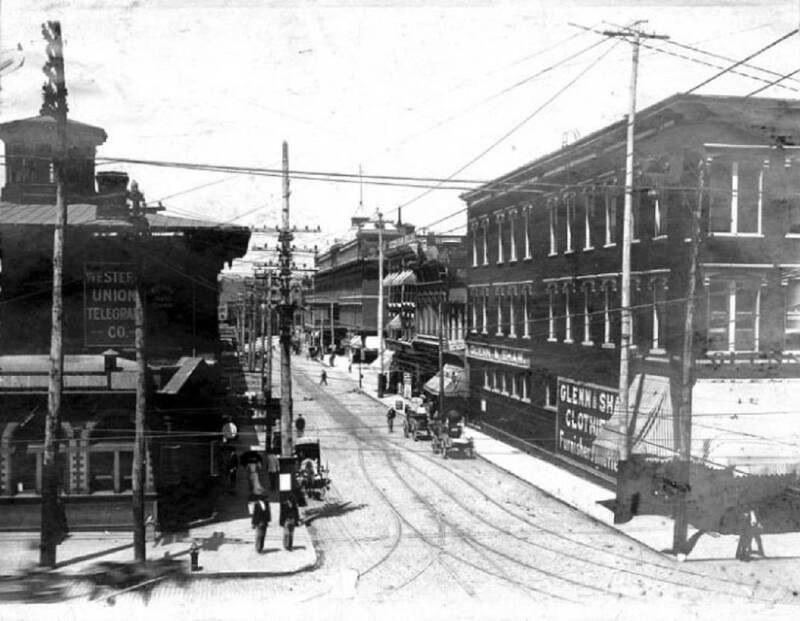 This undated photo shows Chattanooga's Ninth Street around the turn of the century. From the 1880s until 1906, Chattanooga had a small Chinese community. All were men and in the laundry business. The community never numbered more than 15. Chan Yu came to Chattanooga in 1886. He was one of a small community of Chinese men working in the laundry business in the city from 1880 until 1906. He and his fellow immigrants were part of the downtown community and source of great curiosity to other Chattanooga residents. However, they prospered, organized a businessmen's club, looked after the needs of their community, and purchased several lots in Forest Hills Cemetery. A June 1, 1896, story in The Chattanooga Times asserted, "They made money fast, spent it without any evidence of meanness, and kept things moving at a lively gait. Fan Tan (a gambling card game) was played nightly and many of the young men of the city were led to penetrate the mysteries of the (opium) pipe by the revels of the quiet little fellows." The Times covered the death and burial of Chan Yu in August 1887. He was 30 years old, with a family in China. Coming from Detroit, he opened a laundry on Carter Street. He lived in the city about eight months when he contracted typhoid fever. In his delirium, he stabbed himself in the abdomen and neck, dying eight days later of peritonitis. According to the newspaper account, he was buried "after the American way of funerals." Rev. J.W. Bachman, the city chaplain, officiated. Chan Yu was escorted to Forest Hills Cemetery by his countrymen. The article indicated his bones were to be disinterred in five years and returned to China for reburial. The Times later reported the placement of a headstone, purchased by his fellow countrymen. Although the records are incomplete, a second man, Wah Lu, died at about the same time. In April 1890, the Times reported on the Chinese "picnic day for their dead." Adopting a sarcastic tone, the unidentified author misnamed the Qing Ming Festival as "Hong Tong. Referring to the Chinese as "celestials," the reporter described how the "heathens" poured "whiskey, rum, and soda pop" on the graves (as well as chicken and rice) The deceased must have been a lover of whiskey and pop and as for rum he fairly doted on it the amount of first class whiskey poured on the grave would have soaked through to the coffin and made the remains delirious." Continuing, the reporter described prayers to "God, the devil the dead Chinaman's spirit, and to each other Keeping up a jabbering noise which to those who witnessed it was intensely amusing." The reporter noted ChanYee, another Chinese resident, "has converted to Christianity and was in Sunday school at the time and no longer engaged in the ceremony." Described as amused by the practices, invited guests included the fire chief, members of the fire department, the police chief and several policemen. The newspaper covered the death and funeral of Yee Men in July 1891. Coming from New Orleans, Yee Men was in Chattanooga for two weeks when he took his own life. His funeral, according to the Times, was "one of the most peculiar ever held in Chattanooga." Following a prayer by Rev. Bachman, they placed the body in a hearse. The cortege stopped at Sam Wah's laundry, where the deceased lived. His countrymen loaded his clothing, bedding, and personal effects into a wagon. They lit Joss (incense) sticks at the threshold and a small fire in the yard "with some odd looking papers." Proceeding to the cemetery they scattered small pieces of paper along the road, intended as funeral announcements. At the cemetery, they burned all of his possessions. After lowering the coffin, the mourners dropped coins into the grave. After the grave was filled, "The Chinese approached the foot of the grave and lighted several bunches of Joss sticks, placing them on the grave." They placed food, including rice, chicken, eggs, and fruit, on the grave, as well as wine, cigarettes and matches. Each mourner bowed at the grave and poured wine over it. In 1906, "the last of the celestials," Sam Lung died at his Ninth Street laundry of tuberculosis. Described as "honest, faithful, intelligent, and generous to a fault," his body was taken to Atlanta for burial. Sam Lung's death marked the end of the early Chinese community in Chattanooga. The advent of steam laundries put many traditional laundries out of business. While the Chattanooga of today welcomes Asian immigrants, in the early 20th century rising prejudice against the Chinese made immigration more difficult, especially for men wishing to bring their families, and for women in general. No one came from China to collect the remains of the three men buried in Forest Hills Cemetery. Gay Moore, a retired Chattanooga State Community College associate professor, is the author of numerous books and articles. For more information visit Chattahistoircalassoc.org.